A small program I made. Just for the newbies. V1.0.2.8 Updated: Merged two language packs; Changed encrypt encoding; Improved encrypt algorithm; Changed application icon; Make window resizable; Made the program smaller. V1.0.1.2 Updated: Fixed two bugs. P.S. 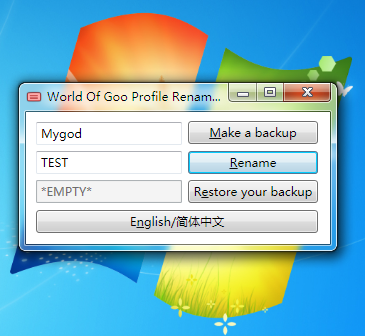 Remember to make a backup of your profile. And if you find a bug, tell me about that please. P.S. I made two language version of it. Choose what you want. Recommendation: Delete the first (non-Chinese) rar and re-upload, so that way people will get the English version if they click the "Install Now" link. More people speak English than Chinese here, I think. @Pavke: It works well and I think changing the name won't be illegal. But the name on the worldofgoo.com won't change. People usually decrypt by hand and edit their profile to change the name ("people" including the moderators ) and this program, in my opinion, makes it much safer and less likely to earn a "cheater" badge. Nice job, mygod! One suggestion: maybe change the icon to a new type of Goo Ball. I keep all my programs on the taskbar, and therefore need to give them different icons. Maybe a Pilot goo? EDIT: Finish! V1.0.2.8 Published. Enjoy it.